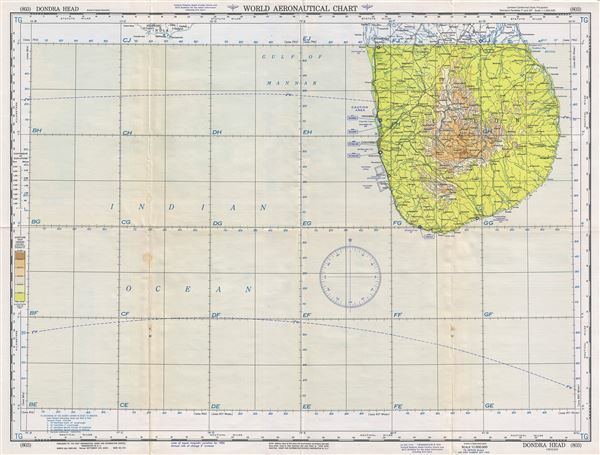 This is a fine 1953 U.S. Air Force aeronautical chart or map of southern Sri Lanka. Focusing on Dondra Head, the southernmost tip of Sri Lanka, the map covers from the Puttalam Lagoon south to Dondra Head. Important cities of Colombo, Negombo, Galle, Moratuwa, etc. are identified. The map is highly detailed and notes towns, rivers, cities, mountains, bays, roads and other hydrographical and topographical features essential for the air pilot. Verso of this chart features legends and a world aeronautical chart index. This chart was published by the USAF Aeronautical Chart and Information Service, Washington 25, D.C., and was issued as chart no. 803. First issued in 1947, this is the seventh edition revised to Oct 1953.